When the cruise industry shed its musty dinner jacket, it was Princess Cruise Line which led the revolution. Having started small, with a single ship cruising to Mexico in 1965, it commissioned what was then the biggest cruise ship in the world and sent the formalities of cruising ashore like an unpopular pilot. Now Princess Cruise Line offers 330 destinations served by 17 ships. Several of these are in the 4,000-passenger category and the Princess ships are at the heart of another revolution. Big cruise ships have a hard job differentiating themselves from each other in the current environment. The Princess slogan, “Escape Completely”, is what, presumably, the entire cruise industry tries to offer. Princess has set its stall in more definable ways. Its unique selling point are its itineraries, and it has focused on a lot of 11-12 day trips. The epic world voyage by Princess is another selling point. The company that changed the perception of cruising has decided to celebrate the traditional. Its brand proposition is discovery and adventure, bringing customers back to the majestic days of cruising. Much of this aspirational majesty will be observed every meal time. Cruise lines decided a long time ago that the happiest passengers are well–fed passengers. All very well when you have 500 on a ship. Nowadays, preparing food for 4,000 passengers is an industrial scale operation. Hotel manager Guenther Kopf brought us into the bowels of the ship to see tons of food stashed high in hidden stores. Astonishingly the waste levels are surprisingly small – cruise passengers consume three times the amount of food that their land-based holidaymakers eat, the wastage is down to 16pc according Guenther. They take their food and beverage sides seriously. Catering employs 618 crew. The annual entry to the Bacardi competition for best ship cocktail is the source of annual excitement. Size brings other challenges. The problem with an “at sea day” on a ship of 4,000 passengers is that the sunbeds are stormed early in the afternoon and the four small deck pools fill up. The Ruby Princess is one of the few cruise ships which still has a pool at the back, and a wave machine to give you the impression you are swimming upstream. The sun is shining on the Med and life’s cares are faraway. And that is what cruising is for. 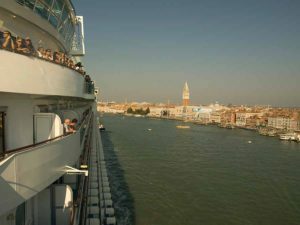 We joined in Venice, an embarkation port of consequence. Smelly, humid, overcrowded, and over-priced. How I love Venice. One toe on the landing boardwalk and you forgive it everything. Venice is the same size as Cork. “Only 100 euro” says the gondolier. You can almost hear it in a Cork accent. Tip: the water bus to Rialto costs two euro fifty and you see just as much. A bit clichéd, but they played “Time to say Goodbye” as we left Venice in the sparking August sunlight. Princess Cruises have given me a perfectly respectable outside cabin on the eighth deck. In mid breakfast the mobile phone gets welcomed to Croatia. Before dinner in the Crown Grill, a specialist meat restaurant, we cruise close to the high white cliffs of Zakynthos. “Where are we?” a passenger from Oklahoma asks her husband. “Algeria, I think,” he replies. The catering manager says they are worried about the pizza, consumption has gone from 170 to 300 a day because of the number of teenagers on board. The children have a designated area of their own on the ship. Each night offers a chance to indulge the inner child in the rest of us wandering the decks and entertainment zones, brat-pack piano solos, ballroom dance lessons, big Broadway musicals, comedians and magicians, an astonishing hypnotist who convinces one volunteer his name is Julie, and a sparsely populated but fun night club where you can bop and watch the backwash at the same time. The most amazing part of the journey is Movies Under the Stars, on a poolside screen. The moon blinks away in the distance. By day the theatre is used for an introduction to the big history destinations we are about to encounter, because our Eastern med itinerary brought us to the cradle of civilisation. Corinth is my choice of day trip (I have seen Athens) and it lives up to all expectations, a tidy site under the Acrocorinthus with the most ancient group of four columns dominating the vista and a cool dead skeleton in the museum. Almost every wedding I have ever been at has had St Paul’s letter to the Corinthians as a reading, and you see why, the sailors talked of little else when they landed here in St Paul’s time. On to another Pauline stop. It is 39 degrees in the shade in Ephesus, where 30,000 day trippers have converged on the ancient city. Civilisation, like beauty, is in the eye of the beholder. There are two points on a cruise where people become stressed, and unfortunately they come at the beginning and the end. The disembarkation is one of the most stressful parts of a cruise. People are disappointed the journey has come to an end. They are stressed by the prospect of the flight home and they have usually overspent (compulsory gratuities are an unexpected shock for European cruise guests, unused to the vagaries of the American system). At the exit gangway of the Ruby Princess in Istanbul our journey ended in time to get out of the port, through rush-hour Istanbul, across the Bosporus bridge in rush hour, and catch an Anadoly Air flight to Amsterdam. By then you feel you need another cruise. Princess Cruises Open up Irish Operation Princess Cruises will offer Irish holidaymakers their world renowned cruises from September onwards available to book at their local Travel Agent. For more details call 01 – 4793258.